The inviting gray finish beautifully compliments the graceful lines and curves of the Dovetail 4 piece queen bedroom set—available at RC Willey. Its the perfect setting to relax, unwind, and pretend that your biggest decision of the day is what book to read! 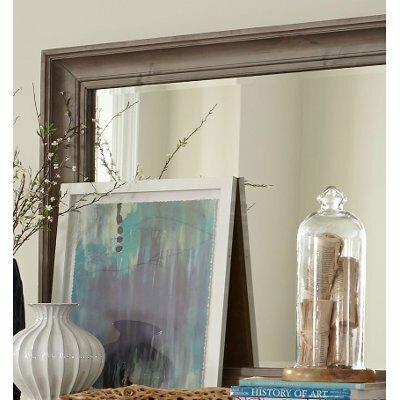 Its classic, sophisticated silhouette exudes timeless charm and its solid pine construction offers durability. Touch lighting on all night stands, side mounted ball bearing glides, dust proofed, English and French dove tailed drawer construction, and top drawers with felt lined bottoms are standard Magnussen Home features. Includes headboard, footboard, rails, slats, dresser, mirror, and nightstand. Chest sold separately. 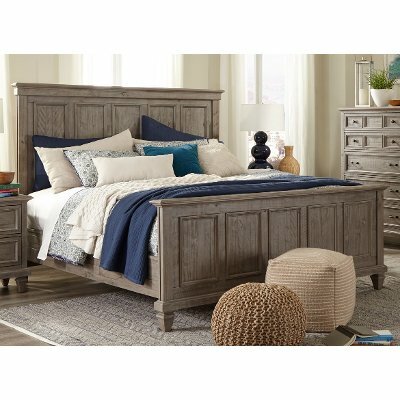 The inviting gray finish of the Dovetail collection queen bed beautifully compliments its graceful lines and curves and it's now at RC Willey. Its the perfect setting to relax, unwind, and pretend that your biggest decision of the day is what book to read! Its classic, sophisticated silhouette exudes timeless charm and its solid pine construction offers durability. 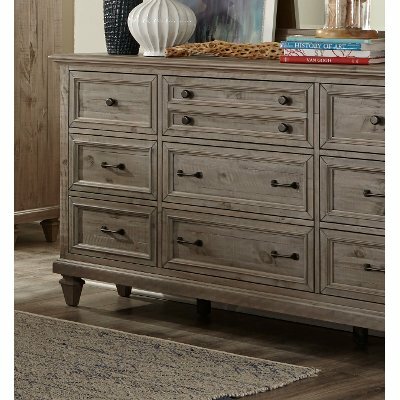 The inviting grey finish beautifully compliments the graceful lines and curves of the Dovetail collection 9-drawer dresser and it's now at RC Willey. Its features include side mounted ball bearing glides, dust-proofing in drawers, English and French dovetailed drawer construction, and top drawers with felt-lined bottoms. The Dovetail collection is the perfect backdrop for relaxing, unwinding, and pretending your biggest decision of the day is what book to read! 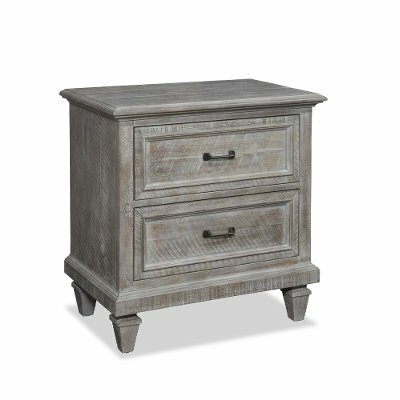 The inviting gray finish beautifully compliments the graceful lines and curves of the Dovetail 2-drawer nightstand—available at RC Willey. Its features include touch lighting, side mounted ball bearing glides, dust-proofing, and English and French dovetailed construction. It sets the perfect backdrop for relaxing, unwinding, and pretending that your biggest decision of the day is what book to read! All cases are sealed for dust-proofing.